At What Age Can You Get Trained as Fork Truck Driver in UK? - Be Certified Today! At what age can someone get trained to drive forklift in UK? This the first question that someone may ask who wants to get into this career of forklift driving. There are few requirements that must be attained, and one of this is to be at the legal minimum age. The legal requirements that must be followed are set for your safety and the people working around you. The law also obliges forklift operators to attain good medical condition, you must not have any diseases and adverse condition that could affect the safe operation of the forklift. It is the company’s obligation once you are employed for the monitoring of your health. Training school or provider, where you will be taking the forklift training course, may not require health exam, but your age will be checked. Hence, we’ve have created this guide on how old you must be to take forklift training and get a job in UK. Now, that you have the final decision of getting into this profession as fork truck driver, it is now best for you to know what would be the requirements you need to have to get a flourishing career in this profession. Here are the three most important requirements you need to obtain in order to get a job: drivers must be trained and certified through accredited training provider, must have superior level of medical fitness for the work they are expected to perform, and most importantly must reach a certain age. This is what we are going to tackle here, what is the minimum age to become a driver. I would like to invite you to some legislations of the government like the National Career Service and Health and Safety Executive’s Approve Code of Practice. Let’s get through this. Read on. The National Career Service has stated very briefly what was the minimum age entry requirement to get trained on forklift driving and this is the 16 years old in non-hazardous workplaces such as warehouses and logistics companies. When forklift operator will be working in ports and docks, which are more dangerous places, the minimum age is 18 years old. Individuals who are under 16 must never operator lift trucks. Further more, the National Career Service has also mentioned some helpful guidelines to get a forklift job. These are: you must have literacy in the English language and basic math, undertook an approved forklift training on the type skills and experience the operator has, and having prior experience in the same work set-up, can be a suitable advantage to get a job. You can also get this type of job through apprenticeship. This is much better approach to get a job because you will be working alongside with skilled forklift operators, you can gain specific skills you need as forklift drivers. The HSE ACOP has specifically stated the minimum age to become forklift operators or trainees, it is must be at the minimum school leaving age of 16 years old, except in ports and docks premises in which an operator must be 18 to be employed there. It is very much the same with the National Career Service. Forklift drivers must also have suitable training course properly completed and certified. Your prospective employer will check your age, especially when you will be working in hazardous environment that only matured individual should be employed. The ACOP has also point out matters about selection of operators and trainees. Additionally, in order to be accepted to take forklift training or get accepted for a job, an individual must be in shape because driving lift trucks can be physically demanding and mentally fit to be able to learn the ability and skill to become an expert forklift operator. An operator must also be dependable and with good attitude towards his job. There are circumstances that forklift trucks may be operated on public roads, the legal minimum age to drive in this locations are 17 years old for trucks up to 3.5 tonnes; 18 years old and above for 7.5 tonnes; and 21 years old for heavier forklift trucks. Furthermore, when trucks is to be driven in public roads, traffic legislation applies, therefore, operators must have valid driver’s licence, aside from the forklift certification they need to have before driving lift trucks. A word for employer whose fork lift trucks are driven in public roads, your trucks must be registered and insured and have paid appropriate taxes. A truck that weighs more than 3.5 tonnes gvw, must be registered under the HGV taxation class, while fork trucks with lesser weight, need to be licensed in Private/Light Goods taxation class. This is in conformity with the Road Vehicles (Construction & Use) Regulations 1986. If truck is to be driven in public roads longer than 1,000 yards, then some modification may need to be done and said taxes may need to be observed as compliance with the same law. On the other hand, if truck is to be traveled in short distance, the law requires that it must be insured, registered, fitted with safety markings (reflectors and lightings) and operator must in be in possession of licence appropriate to his age. Fork truck drivers can work in full time basis when they reached the minimum school leaving age and when they become 18 years old, employment rights for adult person will apply to them. Do not forget, irrespective of the age, operators must be trained and certified as well to drive forklifts. 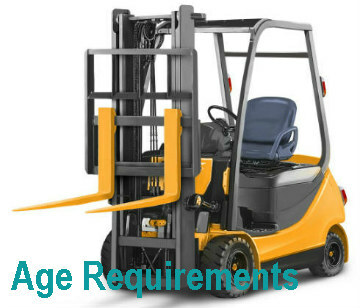 Individuals who are under 16 years old, please do not get affronted by this age requirement, driving lift trucks are dangerous and post risk to you and to the other workers in the workplace, you need to be matured enough to operate the truck safely. We are wishing you good luck for the route that you have taken!